BREAKING: Magic Kingdom Attraction Opening Delayed! Here’s what you need to know about a Magic Kingdom attraction’s opening delayed, plus the all the updates on news, weather, refurbishments and closings this week at Walt Disney World. The Hall of Presidents will re-open soon! Photo by Judd Helms. Join in the July 4th Celebration at Walt Disney World! If you are visiting Walt Disney World during July 4th, listen up! There are some spectacular celebrations you won’t want to miss. First, Magic Kingdom has a special fireworks show called “Disney’s Celebrate America!” This will be presented at 9p.m. on both July 3rd and July 4th and takes the place of “Happily Ever After” for those nights. You can also enjoy fun dance parties in Tomorrowland and Frontierland. If you are in Epcot on July 4th, don’t miss the special Voices of Liberty concerts at the America Gardens Theater. You can also meet patriotic Mickey (and friends) at The American Adventure. Plus, don’t miss the extra patriotic grand finale of IllumiNations: Reflections of Earth. If you are hanging out at Disney’s Hollywood Studios on July 4th, you can catch “Disney Movie Magic” at 9:00pm and “Star Wars: A Galactic Spectacular” at 9:30pm. Find your Happily Ever After! Merchandise inspired by the new nighttime spectacular at the Magic Kingdom, “Happily Ever After” can now be found at the Emporium on Main Street U.S.A. You can complement your wardrobe with a t-shirt, hat, and even a Tervis tumbler. There are also tank tops, pins, and light-up mouse ears. If you can’t make it to Walt Disney World any time soon, some items are also available on the Shop Disney Parks app. Delayed reopening for Magic Kingdom attraction. Disney’s Hall of Presidents, which was scheduled to reopen on June 29th, has had it’s opening delayed. Since 1993, all acting president Audio-Animatronics have had a speaking role, and the current president will be no exception. Disney has finally been able to schedule a recording session for President Trump’s speech. In addition to adding a new president, the Hall of Presidents attraction is getting a makeover as well. 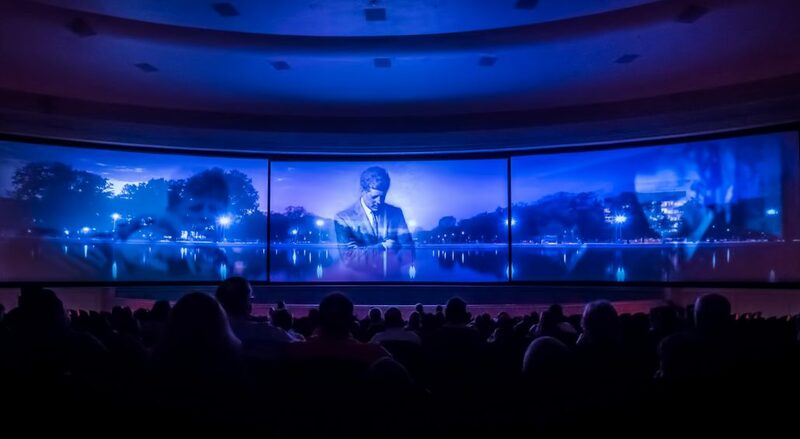 Expect to not only see a new show, but experience it in a refurbished theater with new sound and projection systems. While no date has been set, the Hall of Presidents should reopen in late 2017. Disney Quest is closing (again…really…this time) on July 3rd.